World of BMW Off Road Skills Chief Instructor Simon Pavey has secured his best Special Stage result of the 2009 Argentina – Chile Dakar Rally on the sixth day of the event. 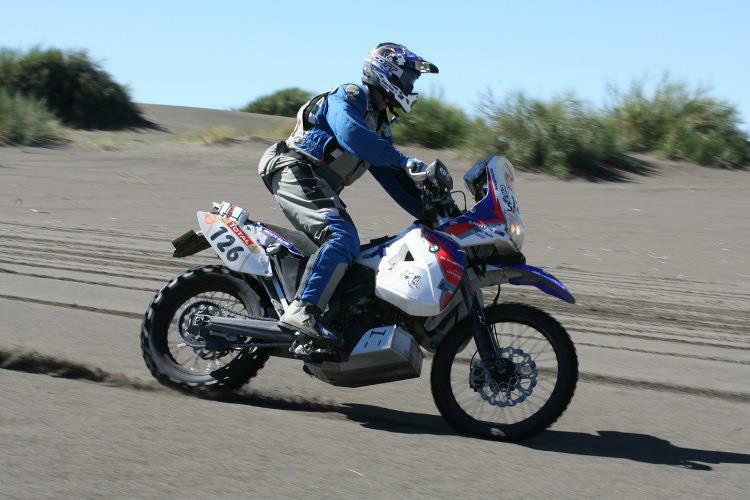 Pavey was 34th overall in the 178km Special, on route from San Rafael to Mendoza in South America and now lies 42nd overall in the motorcycle category. Originally the day’s route included a 394km Special Stage, although organisers changed the Special to the modified 178km route due to the difficulty of the terrain. They deemed the river impassable and removed it from the Special. On review of the challenging route on the 5th Stage, organisers also postponed the start of the Day 6 Special by two hours. The Day 6 route saw competitors race 625km from San Rafael to Mendoza. Competitors faced approximately 60km of sand dunes and difficult water crossings as they travelled at the foothills of the stunning Andes mountain range. "That was another hard day of riding," explained Simon. "The Rally is now testing every competitor in the event and it's a true challenge of endurance for both bikes and riders. “The terrain is technically challenging and we need to keep our wits about us for the navigation. It's easy to ride off route. It's tough, but I am really enjoying it. “I'm pleased with my result, but it is only day six of the Rally. There's a long way to go and I'm going to focus on each day as it comes. On Day 7 of the 2009 Dakar Rally, competitors will cross from Argentina to Chile for the first time in this event. Starting out in Mendoza, they will ride a variety of terrain to include sand dunes identical to the Sahara sand, mountain passes at 3,000 metres and technical routes that will give them a glimpse of the highest point of the Andes at 6, 959 metres – the Aconcagua. After travelling 816km, participants will then cross the border, before arriving at the bivouac at Valparaiso in Chile, which is also the location of the Dakar’s official Rest Day.